You’re a Vital Part of World-Changing Work. Thank You. With thanksgiving to God for His sovereign mercy, I can report that more people than ever are seeking clear biblical and theological teaching through Ligonier Ministries. The year 2018 has been unlike any year in Ligonier’s history. After Dr. R.C. 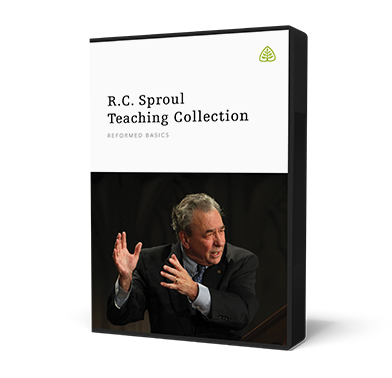 Sproul, our beloved founder, was called home by the Lord last December, we wondered what would happen to Ligonier’s outreach. We moved into the new year with a deepened trust in our sovereign God. We were reminded that the power of God’s Word never fails because Jesus Christ has all authority in heaven and on earth. While we all missed R.C., and our steps were tentative at first, the Lord used your gifts and prayers to accelerate the pace of ministry in the following weeks and months. It’s almost as if a spotlight was turned toward Ligonier this year. The demand for Ligonier’s resources only increased in 2018. Trustworthy Bible teaching is needed so badly the world over. Meeting this need can seem impossible. But encouragement comes when we see how God has used ordinary men and women in the past. The bold Reformer Martin Luther was at heart an ordinary sinner who needed an extraordinary Savior—just like you and me. And like you and me, Luther was not without his flaws. Yet, by God’s grace, Luther took a stand for the gospel, and the Lord used his faithful, courageous witness to change the world. Your support of Ligonier helps Christians grow. I have seen it firsthand. In my travels, I have seen renewal happening in individual lives, in families, in churches, and in communities here in the United States and around the world. Ligonier remains committed to proclaiming, teaching, and defending the holiness of God in all its fullness. By God’s grace and with your help, we will continue proclaiming the historic Christian faith to as many people as possible for as long as the Lord allows. I believe that R.C.’s greatest gift to this ministry was a clear identity. We know who we are as a ministry and what we are called to do. This year, thanks to your support, out of the hundreds of hours of conferences and classroom instruction, thousands of pages published and study Bibles distributed, hundreds of thousands of minutes broadcast and streamed, more than six million people were reached with the hope that they would better understand who God is, who they are, and how the Lord is calling them to live in this world. This is our charter and our sacred trust. And you are a vital part of this world-changing work. Your generous donation now as we approach a new year is needed that we might continue and expand our work by God’s grace. Thank you for standing with Ligonier. Our good faith estimate of the value of this resource is $12.00. Offer expires 12/31/18. Please allow up to six weeks for delivery after your gift is processed.